Going it alone when searching for a mortgage can be very daunting, especially if it’s your first mortgage or first remortgage without a financial advisor. However, when you go it alone with a bad credit rating, the experience can be much more troublesome and very stressful. A bad credit rating can be the result of numerous issues, like not being registered on the electoral roll, no credit history, or worse; missed payments, and County Court Judgements (CCJ). A CCJ is one of the main reasons why you may have an adverse credit history and can be detrimental when applying for a mortgage or any kind of credit or loan. Thankfully, a CCJ doesn’t necessarily mean that you can’t get a mortgage. With specialist mortgage CCJ advice and help from the adverse credit experts here at Simply Adverse, you can improve your chances of being accepted for a mortgage with bad credit and CCJ problems. Why Choose Simply Adverse for CCJ Mortgages? Simply Adverse is a specialist adverse credit mortgage broker, which means that if you have a CCJ in your name, we’re the brokers to call. Our whole focus is on finding adverse credit and CCJ mortgage lenders, so when you choose Simply Adverse, you’re getting the undivided attention of mortgage experts with 9 years of experience working with people with adverse credit histories. Our process, service, and results are unrivalled; we advise you quickly, locate the best competitive rates for mortgages for people with CCJs, and provide first class support throughout the whole process. A CCJ may not help your chances of getting a mortgage, but with the help of our expert advisers, pre-underwriters, and case managers, you have a much better chance of finding CCJ mortgage lenders in the UK. If you’re concerned about the question that many people ask us ‘can you get a mortgage with a CCJ?’, then don’t hesitate to call Simply Adverse today for mortgage advice with no upfront costs, as the answer is often ‘Yes’. A CCJ stands for a County Court Judgement, which is an order that can be issued in England, Wales, and Northern Ireland. In cases where a person has missed payments that they’ve agreed to make or failed to arrange a payment plan agreement, the court is able to order a CCJ. 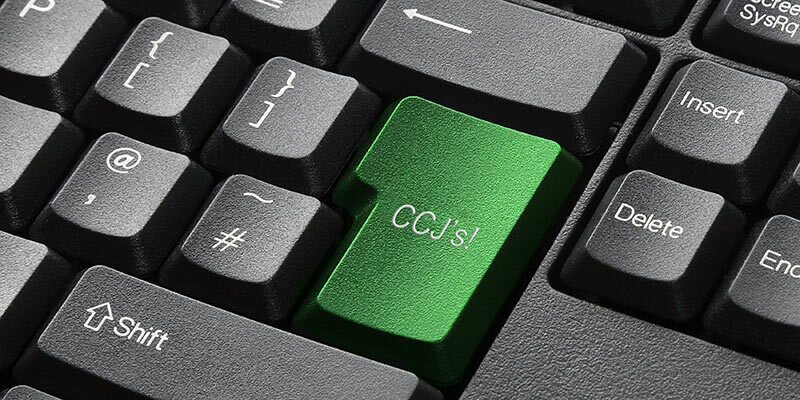 Having a CCJ means that your name is registered in the Register of Judgements, Orders and Fines. The build-up to having a CCJ ordered is quite extensive, so it’s very rare that a person won’t be aware that they have a CCJ. Normally there are a large number of creditor letters, bill reminders, and formal letters that are sent to a person before such a point where a CCJ is ordered. In many cases, a CCJ can be avoided by communicating with creditors to arrange a payment schedule based on personal financial circumstances at the time. Once the case has been taken to court, the person will either be required to make payments in instalments or to prevent a CCJ being ordered, pay the full debt amount. It’s not all bad news though, what many people don’t realise is that CCJs don’t last forever. As long as the CCJ has been settled, it will be unlikely to influence your credit score after a period of 6 years has passed. While a CCJ is a negative mark in your credit history, the answer to ‘can you get a mortgage with a CCJ?’, is in many cases a yes. To get a full overview of your situation, a lot of information is gathered by credit reference agencies, and affordability is reviewed, so a CCJ will only play a partial role in whether you get accepted for a mortgage. The Date of the CCJ – As a CCJ is an order normally given due to missed payments, the date of the order can be a significant factor in how badly the CCJ is viewed by CCJ mortgage lenders. The longer the amount of time that has passed between the order and the mortgage application, the better. How recently the CCJ has been settled is also an important piece of information that’s considered. The Amount of the CCJ – Larger CCJs are not viewed as favourably by CCJ mortgage lenders as those of smaller amounts, especially when the date of the CCJ order is taken into consideration. The amount of a CCJ that is more than 2 years old is not normally a major problem, but a CCJ that is in excess of £2,000 and that has been issued within 2 years of your mortgage application, can be detrimental to the pool of lenders that may consider your application. The Number of CCJs – Having more than one CCJ will limit the number of lenders that are willing to consider your application, especially in instances where you’ve received more than 2 CCJs within the 2 years prior to your application. Whether the CCJ is Satisfied – Getting a mortgage with a satisfied CCJ is much easier than getting a mortgage with an unsatisfied CCJ. Once you have paid off your CCJ in full, your application will look more favourable to lenders. Any Other Bad Credit – If there are other contributors to your bad credit history, then even getting a mortgage with a satisfied CCJ can be more difficult. A credit rating takes into account much more than just CCJs. For more information about your eligibility for applying for a mortgage with a CCJ, you can take our specially designed CCJ credit quiz, or call us today for impartial mortgage CCJ advice from our mortgage experts. Getting a Mortgage with a CCJ – How Does it Work? Your chances of getting a mortgage with CCJ will depend on the type of mortgage that you’re applying for. Buy to let mortgages and first-time buyer mortgages can be more restrictive than remortgages and standard mortgages. The larger the deposit that you can put down and the lower the loan amount that you require, the better the chances are that you’ll be able to get a mortgage. CCJs that are older will often require less deposit than those that have been registered in the 3 years prior to applying for a mortgage. The affordability test is critical in a mortgage application, but often it’s slightly different for people with adverse credit or CCJs. In some cases, it can be possible to secure a mortgage based on 3x or 4x income if you have a CCJ, but the amount that you’ll be offered will change depending on your personal circumstances. One of the worst things that you can do is to make multiple mortgage or credit searches if you discover that you have a bad credit history or CCJ. Always contact an expert for mortgage CCJ advice if in doubt about your eligibility during CCJ mortgage application. For an insight into your eligibility for obtaining a mortgage with CCJ, you can take our specialist CCJ quiz – designed to help people with adverse credit understand their chances of getting a mortgage. Finding a mortgage lender that will consider you for a mortgage with bad credit and CCJ can be difficult, particularly if you’re searching the high street for lenders. However, with the right expert help, it doesn’t have to be an arduous process. Simply Adverse are available 7 days a week to help you find a CCJ mortgage lender in the UK. Simply Adverse is a nationwide broker that provides a tried, tested, and successful service for connecting adverse credit mortgage lenders and CCJ mortgage lenders with people searching for first and second mortgages, as well as remortgages and buy to let mortgages. If you’re searching for a mortgage and are worried about a recent CCJ or one that you’ve had for many years, then we’re the service that can help. Applying for a mortgage with a CCJ can be a long and arduous process, but at Simply Adverse, we take care of it all for you. We take your specialist circumstances to the whole market in order to find you a mortgage with the most competitive and best CCJ mortgage rates. You’ll never be asked for payment up front when you choose Simply Adverse. There’s no charge for our services until we have obtained you a formal mortgage offer and the bank commits to lending – you can walk away at any time during the process. At Simply Adverse we like to provide a comprehensive service, which includes our eligibility quiz – an excellent tool to see where you stand with getting a mortgage. What CCJ Mortgage Lenders Do Simply Adverse Work With? Having an adverse credit history can limit the number of lenders that will consider you for a mortgage, but when you choose Simply Adverse as your CCJ mortgage broker, you get access to a much larger number of lenders than what’s on the high street. There’s no need to struggle alone trying to find high street lenders that will accept you for a mortgage, not when you can count on Simply Adverse to take care of the process for you. Our extensive experience of the market means that we know exactly where to look for the top mortgage lenders who accept CCJ at the best possible rates. Like the hundreds of people with adverse credit histories who have used our unrivalled service before, you can simplify the process of finding a mortgage lender who accepts bad credit by calling Simply Adverse today.